QuickBuilder is a high-level programming language specifically designed to rapidly program, debug and deploy complex automated equipment. Motion Sequence Blocks with distributed execution. Using QuickBuilder, you have the tools you would expect to find in a modern programming language, but in a state-based language that closely parallels your process. Designed to serve the needs of some of the world’s most advanced technology manufacturers, QuickBuilder supports the accelerated development schedules and demanding technological and performance requirements found in these companies. In state-based programming, a step defines the only instructions active within a task at that moment, corresponding to the physical state of the machine or process being controlled. Steps are composed of high-level instructions, which can include the control of named I/O points. Of course, far more complex mathematical and logical functions may also be performed in a step, as well as triggering user functions, multitasking, etc. Click below to view available built-in functions. MSBs are blocks of specialized motion control instructions, automatically downloaded and executed locally on a hardware-based servo or stepping motor control module or in an IncentiveECAT CPU core. This alleviates the main CPU of the burden of executing time-critical instructions, especially important in large, sophisticated systems. The above example executes a trapezoidal move, waits 250mS, then triggers another MSB named “GoBack” in the background. Click below to view the Motion Sequence Block instruction set. 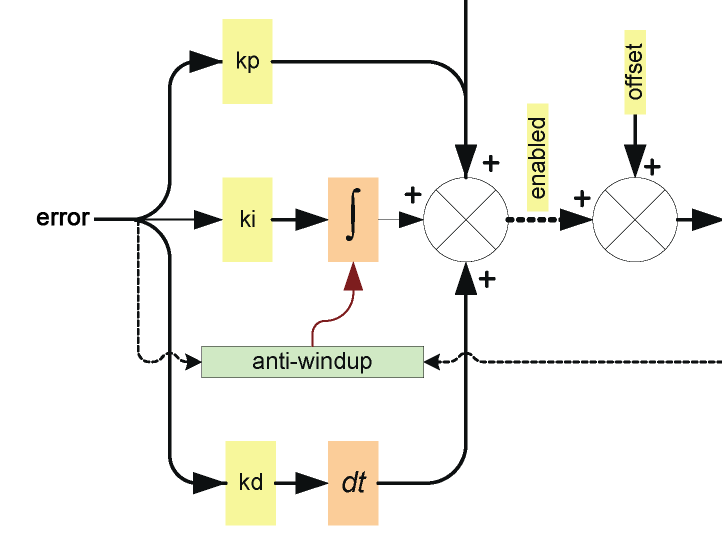 PID loops may be configured to run in the background, independent of the main program flow. The control program still has complete access to all PID parameters for tuning and setpoint adjustment. Download a Free Trial of QuickBuilder below! By clicking the button below you are certifying that the identifying information you entered is correct. Your IP address 66.249.64.101 will be logged. An email will be sent to the address you provided above with a link to download the requested QuickBuilder information. QuickBuilder may be downloaded and run as a trial version for 30 days. To run for more than 30 days, contact CTC Sales at sales@ctc-control.com or +1-888-818-2600 to purchase the software and receive an activation code. 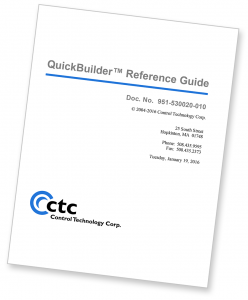 Download a free copy of the QuickBuilder Reference Guide, with detailed instructions for using QuickBuilder, as well as a wealth of additional information about the use of the QuickBuilder language and associated development tools.